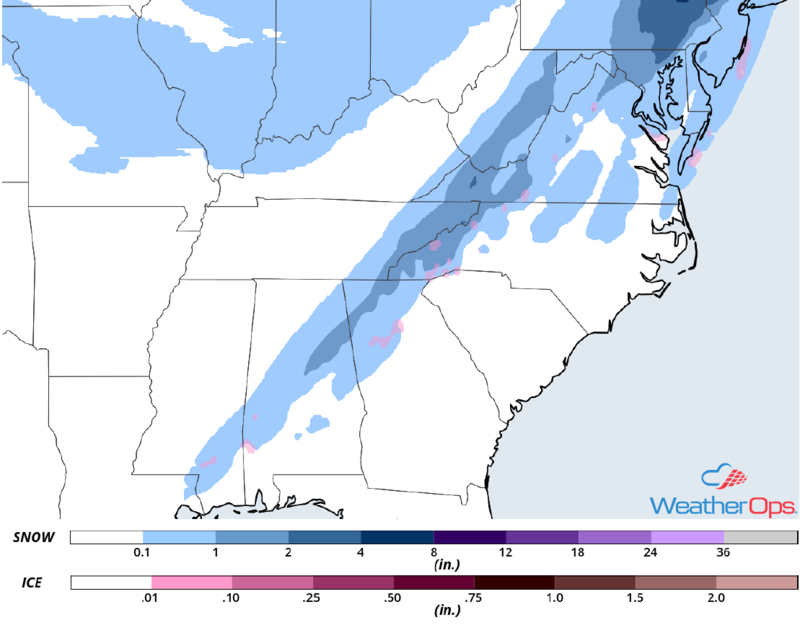 Snow will continue across the Southeast Tuesday morning as a cold front moves through the region. An area of low pressure will bring snow to portions of the Northeast through Wednesday. Elevated winds and seas are expected across the Gulf of Mexico through early Wednesday morning in association with a cold front. A strong cold front is moving across the region, resulting in ongoing moderate to heavy snowfall this morning across portions of central Mississippi, northern Alabama, and northwestern Georgia. This system will continue to progress eastward today. Air temperatures are forecast to warm above the freezing mark across much of the region, allowing snowfall to transition to primarily rain. Snowfall accumulations of 1-3 inches are expected through the morning. Two areas of low pressure will consolidate into one system later today. This system will move northeastward, bringing gusty winds, moderate to heavy snowfall, and cold air to the region. 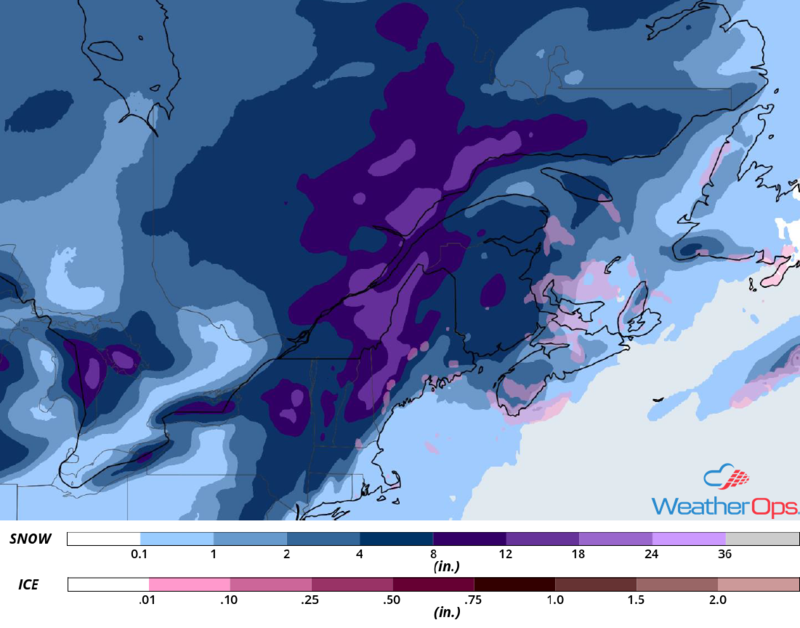 Snowfall totals will range 8-12 inches with locally higher amounts in excess of 15 inches. Due to the very cold air in place, snow will likely be dry. Wind gusts in excess of 45 mph will result in blowing snow and whiteout conditions. Use extreme caution while traveling, as roads will likely become hazardous or impassible in some areas. A strong cold front will continue to produce strong winds and elevated seas across the Gulf of Mexico through early Wednesday morning. 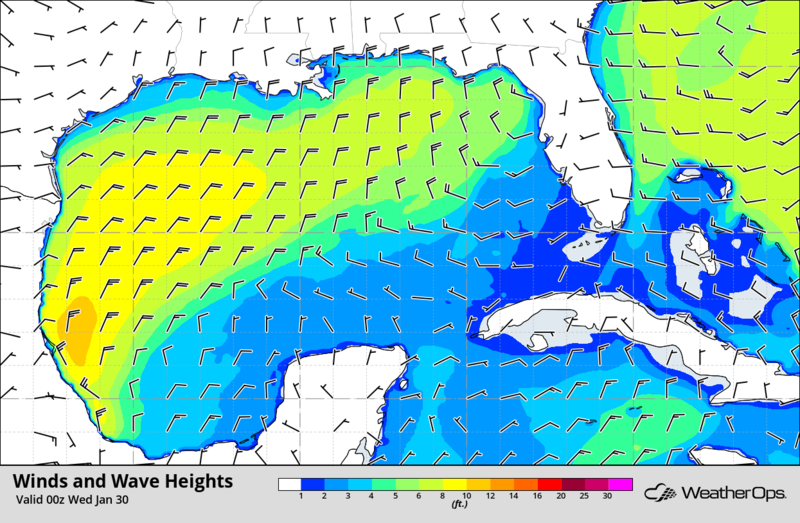 Winds ahead of the front will be south-southwesterly to west-southwesterly at 10-15 knots. Behind the front, winds will be northerly to north-northeasterly at 30-35 knots with gusts in excess of 45 knots. Seas will range 4-8 feet near the shore and 8-12 feet in the deeper waters. Freezing rain and snow will move into the Ohio Valley on Friday as an area of low pressure moves eastward. Rain and snow are expected across the Northeast on Saturday. An area of low pressure may bring some freezing rain and snow Sunday into portions of the Northern Plains. This activity will spread into the Great Lakes on Monday.